APPSC gives a good employment chance through the new AP Forest Beat Officer Notification 2019 released on 12th Feb 2019. 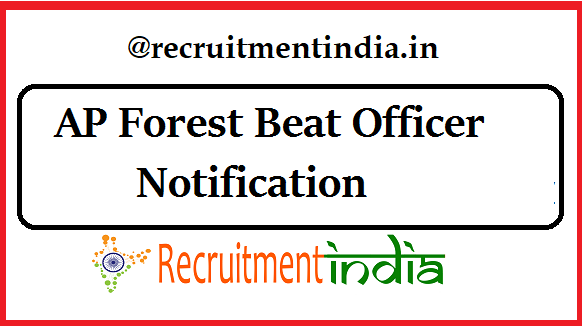 With intermediate qualification one can apply for the APPSC Forest Department Recruitment of 430 Forest Beat Officer (FBO) and Assistant Beat Officer Vacancy. At psc.ap.gov.in the activated AP FBO, ABO Application is available from 5th March to 27th March 2019. Andhra Pradesh Public Service Commission using the single APPSC FBO, ABO Notification released recently wants to invite the candidates to attend the selection rounds. You guys wishing to attend for that rounds then apply the AP Forest Beat Officer Notification 2019. To the unemployed youth of Andhra Pradesh check out the good news here. On hearing this latest APPSC job news the hope of getting the employment will come into their minds. Just with 12th or intermediate qualification, you people can appear for the new APPSC Forest Beat Officer Recruitment 2019. Of course, it is true candidates who are having the intermediate certificate and physical measurements can be a competitor in this AP Forest Beat Officer Notification 2019. Additional more information is discussed with the visitors from this page. The official detailed notification is released by the APPSC board on 12th Feb 2019, excited candidates have to wait till 5th March 2019 for the enabling of the AP FBO Application Form. On behalf of the AP Forest Department Services APPSC taking the responsibility of fulfilling the 430 AP Forest Department Vacancy in the posts called Forest Beat Officer (FBO) and Assistant Beat Officer(ABO). A large portion of the vacancy come under the Forest Beat Officer Posts. So those are having the willingness in order to apply the AP Forest Beat Officer Notification 2019 let’s begin the verification of the requirements suitable for the FBO, ABO posts. Matching of the educational qualification, age limit, physical measurements is compulsory for the applicants who are enrolling the Latest AP Forest Department Recruitment. What the information mentioned in the official advertisement that is discussed herein simple words so it will guide to take the decision of participating in the APPSC ABO Recruitment Process. APPSC board in view of selecting the applicants for the 430 FBO, ABO Vacancy decided the post wise educational qualifications. AP Forest Beat Officer(FBO), Assistant Beat Officer(ABO) educational qualification as Must have passed Intermediate Examination or its equivalent. Before registering the APPSC FBO Recruitment, the candidates must have the age limit criteria as per the norms. APPSC FBO Application Fees details are discussed category wise here. APPSC department to select the applicants for the 430 Vacancy conducting the following selection rounds. At present through the latest AP Forest Department Notification, the hiring vacancy is 430 Vacancy. Andhra Pradesh Public Service Commission in its official site attached the official notification of 430 FBO, ABO Vacancy in AP Forest Department. The emergence of giving this notification is only to inform the job seekers about the hiring of 330 Forest Beat Officers, 100 Assistant Beat Officer Posts. Through this notification, only APPSC invited the applications with respect to the APPSC ఫారెస్ట్ బీట్ ఆఫీసర్ రిక్రూట్మెంట్. As per the latest notification, the vacancy number is around 430. But there are chances of rising the vacancy count, so job seeking postulants won’t neglect this recruitment. Before moving to the registration part candidates have to get the confirmation on whether they are the right competitor in all the aspects or not. Interested postulants stay in touch with APPSC site to get the activated link of AP Forest Beat Officer Application Form. In the notification, it is mentioned that the activation of the application link is going to do on 5th March 2019. So there is no hurry process for the contenders to submit the details. A lot of time is given by APPSC board to arrange all the documents and details that are needed to be upload in the psc.ap.gov.in FBO, ABO Online Form. At any moment in between 5th and 27th, March 2019 eligible contenders can submit the application form. In the meantime for the application enabling competitors can now collect the AP Forest Beat Officer Syllabus 2019. This AP Forest Beat Officer Notification 2019 is the direct recruitment of the applicants based on the performance in all the AP FBO selection rounds. The post AP Forest Beat Officer Notification 2019 | 430 FBO, ABO Vacancy | Apply @psc.ap.gov.in appeared first on Recruitment India.